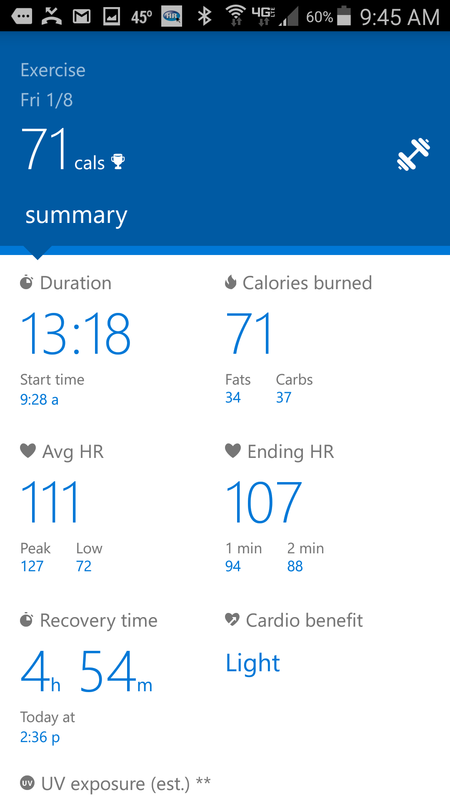 Ever since I discovered Microsoft’s Band 2 I have been eager to test the accuracy of its heart rate monitor. As you may have heard, Fitbit is currently being sued for having an inaccurate optical heart rate monitor. 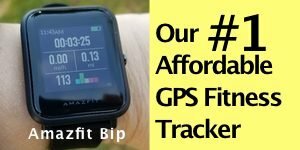 Optical heart rate monitors are a popular feature of wrist-worn fitness trackers but they are notorious for being inaccurate across nearly all devices that feature them. To be fair, I haven’t reviewed a Fitbit yet, but I plan to do so. Anyway, I was deeply interested in how accurate the Band 2’s HR monitor is. After all, a HR fitness tracker is kind of useless if it’s providing false data and they can be potentially dangerous if they indicate highly inaccurate HR numbers. It’s important to know what your true heart rate is when working out and though only a clinical setting can give you the most accurate numbers, chest heart rate monitors do a very good job, so I set the Band 2 up against the Garmin Vivoactive paired with a Garmin chest heart rate monitor. 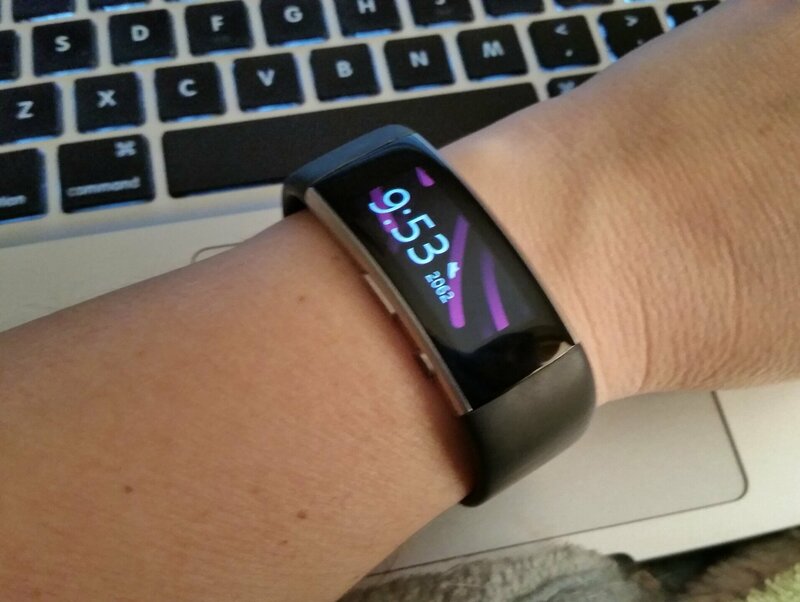 The Band 2 reminds me a lot of Samsung’s Gear Fit, which I own and like but feel is missing some key features, namely a built-in GPS, barometer, better integration with third-party fitness apps, and a decent keyboard to respond to text messages. 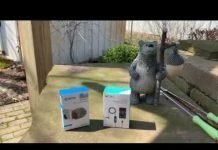 I’ll be comparing the results between the Band 2 and Gear Fit in a future review, since they are so similar, but for now I’ll be focusing on the accuracy of the Band 2’s heart rate monitor while walking on a treadmill. I’ll also be testing it while hiking and I’ll update this article when I complete that test. It’s January here in Illinois, so I’m waiting for a chance to get outdoors to do that! I’ll also be doing a complete review on all the features of the Band 2 because there’s a lot to cover. 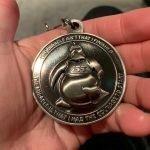 This test was just a short workout on a treadmill comparing heart rate (beats per minute) at the beginning of the workout and at each passing minute. 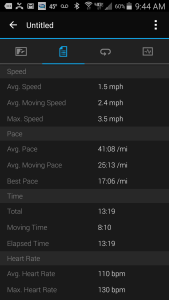 The highest speed was 3.8 mph according to the treadmill. I cooled off for the last minute at 2 mph. I was delighted that the Band 2 did so well, especially considering I wore the band with the watch facing upwards. Microsoft recommends wearing it with the watch facing down, but I personally find it really uncomfortable, impractical, and unattractive that way. I didn’t observe any weird spikes or dips in my heart rate throughout the workout on either device. The numbers were almost always either identical or within 1-2 beats of each other. 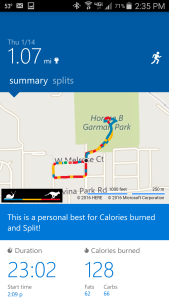 Where the results differed was in the calorie burn. 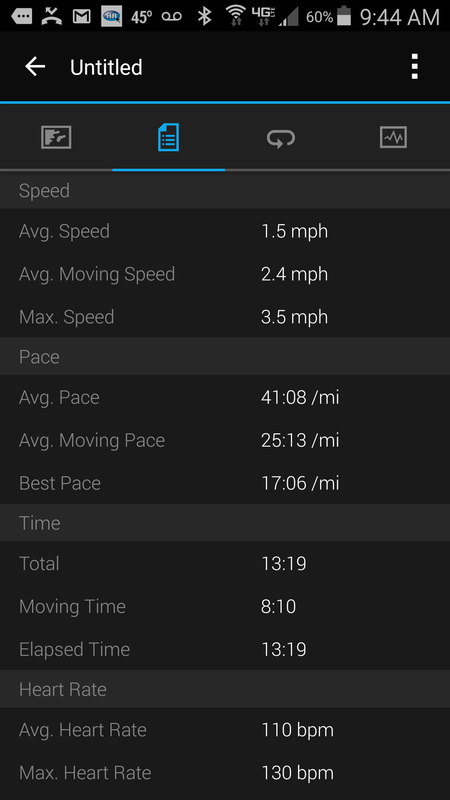 The Vivoactive estimated my average speed and moving time considerably low, which probably explains why it calculated a much lower calorie burn. However, just going by my average heart rate and the length of the workout, the estimated calories I burned is still low. For my age and weight, if my average heart rate for 13 minutes was 110, I should have burned much closer to 70 calories, according to calorie burn calculators. 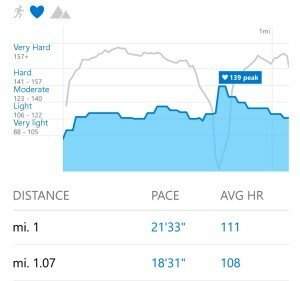 Possibly, my writing down the results each minute with my right hand skewed the results on the Vivoactive, since I was wearing the Vivoactive on my right wrist. I’ll give it some benefit of the doubt. I have found it to be much more accurate than that on a consistent basis. In this test, however, I was mainly concerned with how accurate the Band 2 was estimating my heart rate while walking on my treadmill. So, I’m thrilled that the Band 2 did so well. I did select the general exercise option on the Band 2 for the workout and it seems to have worked very well for the treadmill. 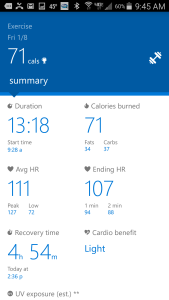 I’ll give the Band 2 another test against the Vivoactive to make sure I can rely on the numbers it’s giving me. If it remains accurate against the chest heart rate monitor then I’ll be happy not to have to wear a chest strap while working out on my treadmill again! 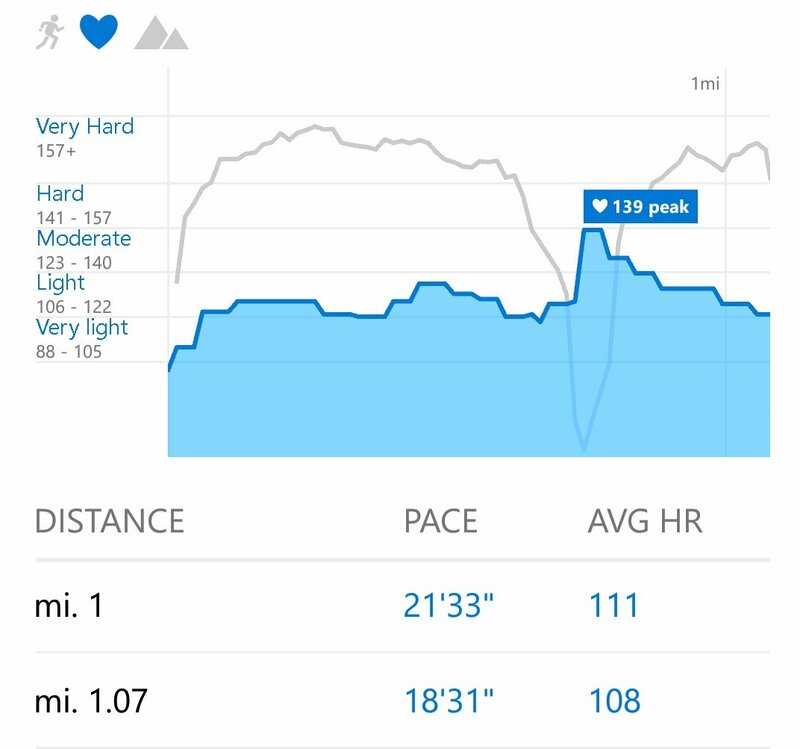 I got a good January day to go for a walk outdoors, so I have the data comparing the Band’s HR sensor with a Garmin chest HR monitor connected with my Garmin Vivoactive. This was about a mile long walk on neighborhood streets and a short hike through a hilly and wooded park. 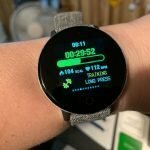 I kept an eye on my Band and Vivoactive every 30-40 seconds and they were nearly always indicating data within 1-2 beats of each other. Many times they were showing the exact same rate. I wore the Band 2 with the face up, like in the previous test, so I don’t see any need to wear it on the inside of the wrist, unless you’re getting inaccurate data. Above: Vivoactive connected to Garmin HR strap results. So breaking down the data, the heart rate was very similar. The chest HR monitor did show a higher peak heart rate but the average rate between the two was within a couple beats. The Band’s was 112 and the Garmin 114. There is quite a bit of difference in the estimated calorie burn. 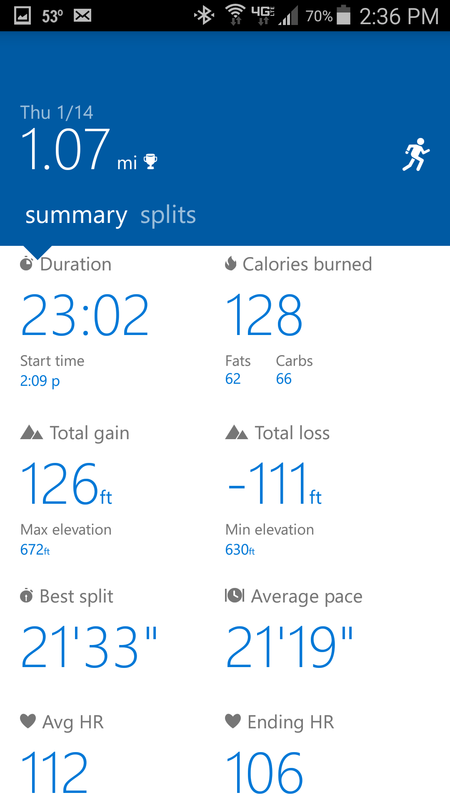 The Band estimated it at 128, while the Vivoactive estimated my calorie burn at only 86. 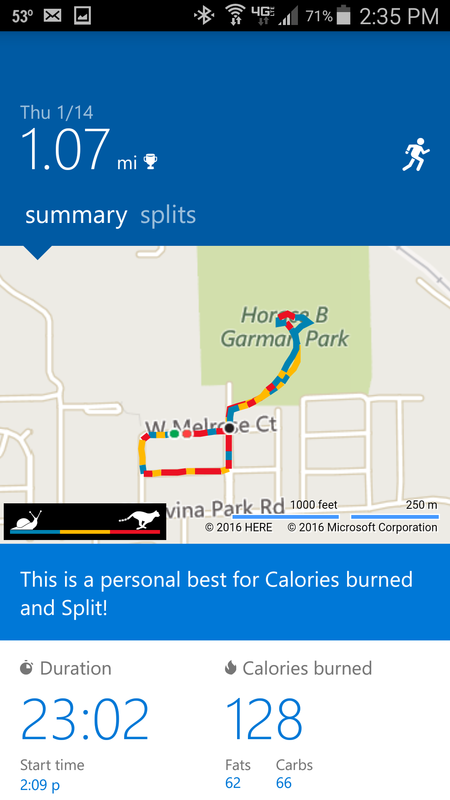 The Band’s estimated distance was 1.07 miles and the Vivoactive was 1.10, so they’re very close. The elevation gain was quite a bit different between the two. The Band 2 estimated the total gain at 126 ft and the estimated loss at -111 feet. 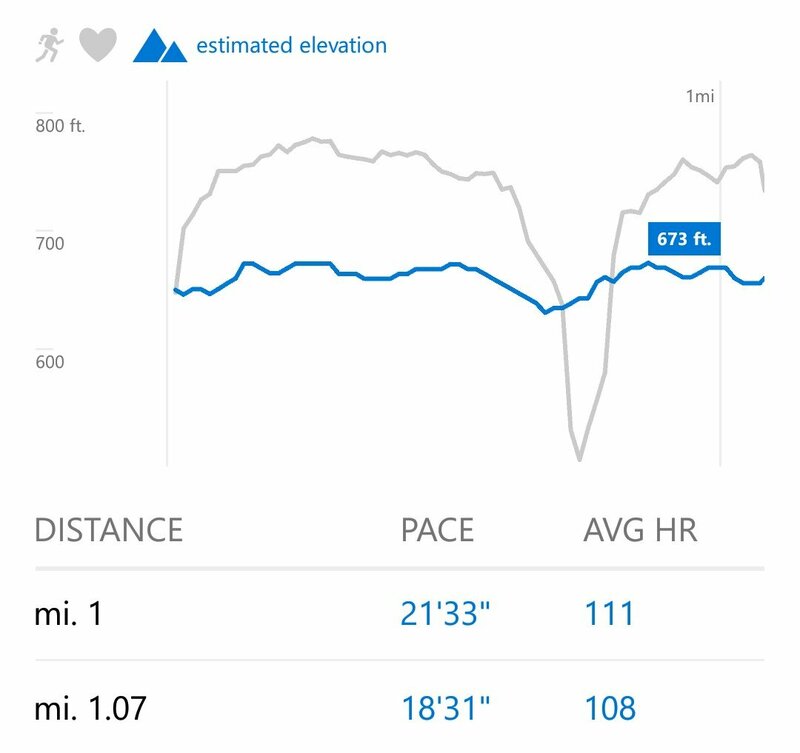 The Vivoactive estimated the elevation gain at 23 ft and loss at 23 feet with a min elevation of 623 ft and max of 663 ft. The Band’s estimated max elevation was 673 ft. 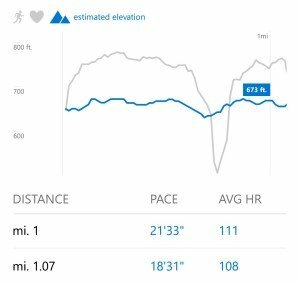 The difference is likely attributed to the fact that the band has a built-in barometer that can detect elevation changes as I was walking up and down the steep trails of the park. The Vivoactive is working off of GPS data alone. The Band 2 actually locked onto the GPS location more quickly than the Vivoactive, which surprised me. I had to move to a different location before the Vivoactive locked on but both were locked in within about a minute. They gave very similar results. 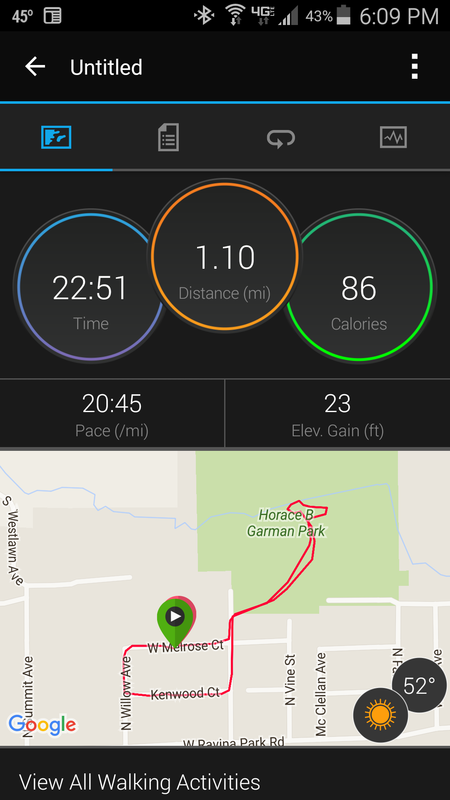 The Vivoactive notified me of the 1-mile mark about 15 seconds before the Band. 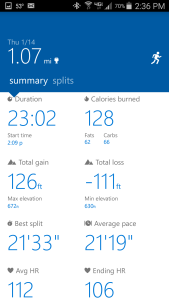 I do like the graphical results of Microsoft Health’s app better, though the Vivoactive provides more data. 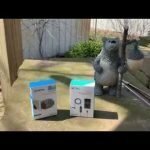 I was totally impressed with how accurate the Band 2’s HR monitor was in comparison to a chest HR monitor for both tests. 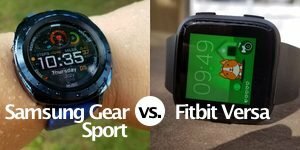 If you were to ask me which fitness tracker I prefer, it would be a toss up but below is which device I would give my highest marks for by feature. Which one you should choose depends upon what types of workouts you commonly do and your lifestyle. If you are outdoors a lot and do a lot of water activities like swimming, boating, fishing, kayaking, etc., then the Vivoactive would be your choice because it’s not only water resistant but waterproof. 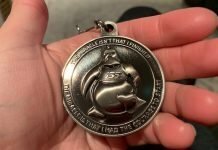 In fact, you can swim with it on! 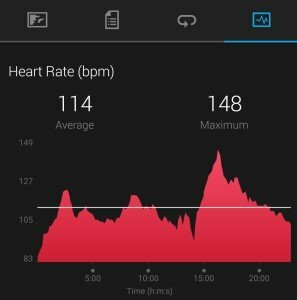 If you use chest HR monitors and cadence sensors for cycling then again the Vivoactive would be the choice because it has the ability to pair with such devices. If you do a lot of weight lifting, resistance training, aerobic exercises, zumba, dance, etc., then I’d take a look at the Band 2. 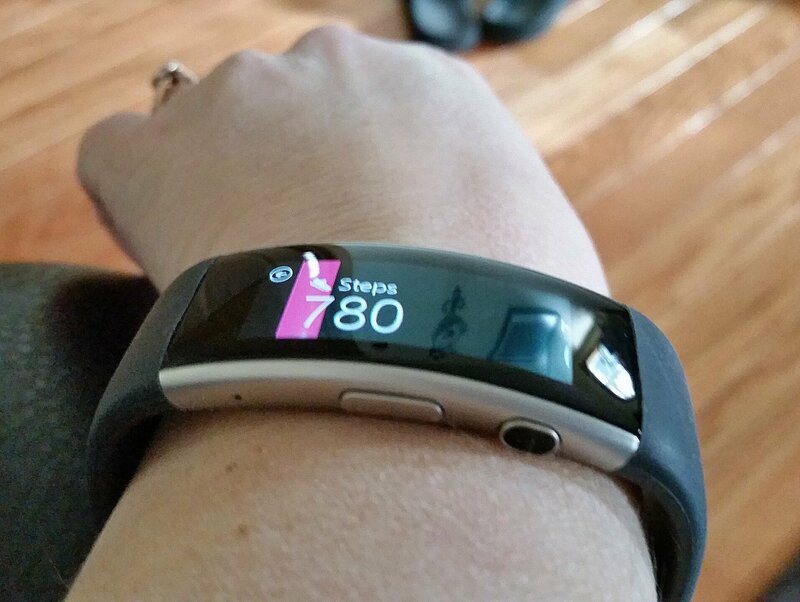 The Band 2 also has guided workouts that you can download. If interaction with your smartwatch notifications matters to you then the Band 2 would be the choice. Both devices have the ability to measure golf, though I haven’t tried that feature out yet. If comfort is very important to you then the Vivoactive would probably be your choice. It’s lightweight and the band is very adjustable. You can also change out the band if it were to break or you wanted to switch from rubber to leather. But for me, I’ll be keeping both because I’ll use both depending upon what type of workouts I’m doing. If I’m going to be doing water related activities, then I’d use my Vivoactive. Also, if I’m going to be doing prolonged outdoor activities and don’t want to worry about the battery going dead on me, then I’d use the Vivoactive. 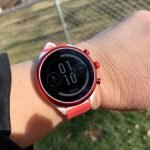 The Vivoactive’s screen in bright sunlight is amazing, while the Band 2’s screen can be hard to read. 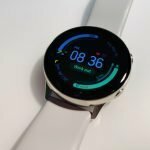 In dim light the Vivoactive can be hard to see, while the Band 2 is very bright and clear. For my day-to-day activities and workouts, I’ll be using the Band 2. I love how I can do more varied workouts beyond just walking, running, and cycling. I also love the notifications and the ability to respond to text right from my wrist. 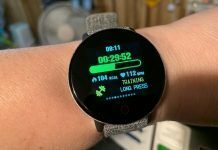 The barometer is a big plus for me too because I do a lot of cross-country walking and hiking and the Band 2 can detect the terrain differences, which matter in calorie burn estimates. Hopefully, one day there will be one device that does all the things that I want it to do but until then, I’ll be keeping both the Microsoft Band 2 and the Garmin Vivoactive.